Anyone can buy a fleet of Porsches or caravan of Ferraris—okay well maybe not anyone—but its takes a real “big time” celebrity to construct a garage more expensive and fancier than most people’s houses. 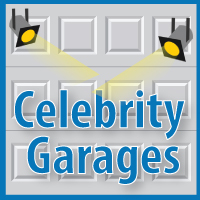 Check out some of these mind-blowing garages of celebrities with a serious need for speed and style. Try to guess which celeb owns each automotive palace—the answers are at the end but no cheating! Highlights: This actor not only has garage space big enough for his 16+ cars but also two separate ports and private runways for his 2 private jets. Some celebs may claim to use their jets like automobiles but this actor, who is licensed to fly planes as large as 747s, really does. Hint: From singing in old greasy garages to dancing his way through the disco fever of the 70’s, this celebrity’s skills extend well beyond simple acting. Highlights: This actor organizes his 70 sports cars by both brand and color. Within this extensive garage space is a full functioning gas station. All 70 machines are kept in running condition at all times, ready for him to drive them to various events and private drives. Hint: Fashion, not automobiles, is where his original expertise lies. Highlights: With 200+ cars, 90+ motorcycles, a full mechanic tool setup and team, and enough antique posters to cover the entire interior and exterior twice—this complex is said to better resemble a museum than a garage. In fact, this garage is so famous it even has its own website and Facebook page. Hint: He has turned a few heads not only with his Late Night jokes but also his overly prominent chin. Highlights: Looks can be deceiving, and the exterior of this actor’s 46-car Porsche collection is just that. Beyond those walls lies a 3-story subterranean compound featuring 4 separate garage spaces, an elevator, a clubroom with a pool table, a kitchenette and bathroom, and a sizable office. Hint: He developed and starred in his own self-titled sitcom. With these elaborate setups housing some of the rarest cars in the world, these garages should come with a warning: “Will Cause Jaws to Drop”. Big cars, small cars, fast cars, old cars—there’s no question these impressive car collections are bound to cause a little garage envy.